As a small, local business, utilising local maps is arguably the best way to out-rank bigger corporations. A local map aims to show searchers businesses based on their location, giving small business owners with a brick-and-mortar store greater visibility. Can't seem to get yourself listed on local maps? Here's how to do it. To get your business listed on Google Maps, you'll need to create a Google Plus Business Account. Before you do, make sure you don't already have an active profile, as having multiple listings can affect your visibility on maps. If you do have an active profile, you can delete or update your listing. To be listed on Google Maps, Google will ask you to verify your business. It will do this by sending you a letter with a pass code, which you will have to fill in online once received. When filling in the information for your account, make sure the information is correct and consistent across all online channels. For example, make sure the telephone number is local and not a mobile number (this helps Google optimise your listing). When listing your business address, make sure it's the same as on your website and other online profiles (social media, Yelp, etc.). Any inconsistencies sends Google mixed signals about your business and impacts their position on local maps. Setting up a local map listing on Google is free, and it typically takes 1-2 weeks before your business is visible on Google Maps. Many businesses only focus on listing their business on Google Maps; yet Apple holds a 41% market share in Australia. Studies reveal that as much as 80% of local searchers on mobile convert to Apple Maps. Many of these searchers will be using Apple Maps to find businesses. Putting your business on Apple Maps is free and straightforward. First, visit Apple Maps Connect and create a profile for your business. Much like Google, make sure the information you enter is consistent and the same across all other platforms. I suggest creating a spreadsheet file with all your business's information and to copy and paste that every time you create a new account somewhere else. This guarantees your information is always consistent. Apple will then call the telephone number you provided to verify your listing and your business will appear on Apple Maps within a week or two. 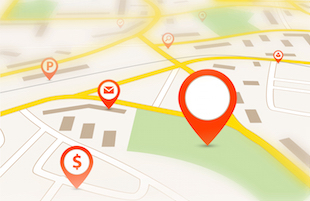 Listing your local business on local map search is essential. A Google study revealed that 50% of smartphone users visit a store within 24 hours of searching, and 18% of local smartphone searches lead to a purchase within a day. If you're looking to grow your business and increase your business's online visibility, then learn how to get found on Google and turn visitors into customers.